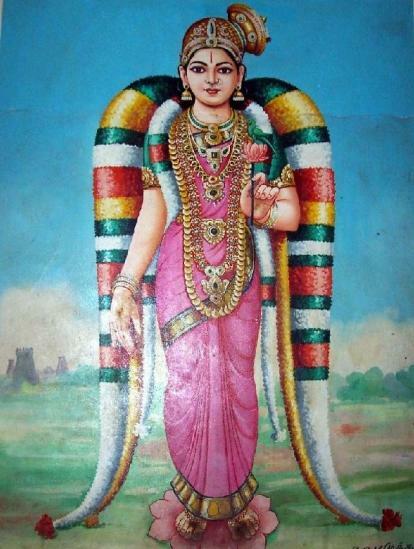 Here I continue to publish significant works of Drāviḍa Veda – Divya Prabandham – and this time – it is the work Tiruppāvai in 30 verses by an ancient Tamil saint – Śrī Āṇḍāḷ - the only female saint among the classical 12 Āḻvār saints of Śrī Vaiṣṇavism. The work itself in original Tamil transliterated text and English translation can be read on this current page, but there are classical commentaries of each verse provided in the following pages. They are very recommended indeed, since the original text of Tiruppāvai is written in a very symbolical language and of very ancient times. The Religious tradition of Śrī Vaiṣṇavism considers the birth year of Śrī Āṇḍāḷ herself is as ancient as 3005 BCE. The modern researchers call more recent dates, but it is without a doubt – Śrī Āṇḍāḷ and her work Tiruppāvai is one of the cornerstones of Śrī Vaiṣṇavism tradition. Śrī Āṇḍāḷ is also known under other name – Godā and often identified as an incarnation of Nīla Devi, one of consorts of Lord Veṅkaṭeśvara, usually following right behind him. According to other sources - She is Bhū Devi, the Mother Earth, another consort of the Veṅkaṭeśvara. Śrī Āṇḍāḷ is known also as the consort of Lord Krishna – Nappinnai. In Northern India the consort of Krishna is known as Rādhe, even this name is nowhere mentioned in Śrīmad Bhāgavatam Purāṇa. But in Southern India the name of Krishna’s consort is Nappinnai, as it has come down through Āḻvār’s tradition. The work Tiruppāvai is mostly dedicated to transcendental love and complete surrender to God, first of all – Lord Krishna and his story with uneducated, simple, yet loving Gopīs – who have not any spiritual or transcendental knowledge or abilities, except their deep-felt connection with Krishna – child and complete surrender to his leadership. Also several other Viṣṇu Avatars are mentioned in the poem. I offer my obeisance again and again to Goddess Āṇḍāḷ, to Her alone who has awakened Lord Krishna sleeping on the mountain-like lofty breasts of Goddess Nīla. Āṇḍāḷ has informed Him of her total dependence on Him in accordance with the hundreds of Vedāntic texts; Āṇḍāḷ who robustly enjoys Him: after binding Him with garlands that she had first worn. The saint-poetess Āṇḍāḷ was born in Srivilliputtur (puduvai) surrounded by paddy-fields and water reservoirs full of beautiful swans. She dedicated her beautiful garland of songs, singing them sweetly. She offered to Him (Krishna) the flower-garland, after wearing it herself. May all of us reverence her and sing her poems. O Āṇḍāḷ radiant like flash of lightning! You bedecked yourself first with the garland intended for Lord Raṅganātha and then offered it to Him; by your great talent in poetry you composed the renowned and ancient hymn of Tiruppāvai. with the same sincerity of devotion that you asked of Kāmadeva — "O Kāmadeva, be pleased to make me a humble servant and bride of the Lord Veṅkaṭēśa!" maidens bejewelled and intent on bathing, come out! To sing his praise and gain the world's. No collyrium for the eyes; no flowers bound in the hair. and joyfully seek our liberation. And spotted bees will doze in the blue lilies. Big cows with their udders full will yield milk at a touch. And wealth unfailing will fill the land. O Great Varuṇa, God of Rain, withhold not anything! Blaze with lightning like the Discus in Padmanābha’s hand. may live, and bathe in the joyous month of Margali. and sing his praises. Let us meditate upon Him. like cotton in a fire. Therefore let us sing His glory. the thunderous sounds of the great white conch? the names of Hari, resounding, let that Name enter our hearts and refresh us. ōsai paḍuttu tayir aravam kēṭṭilaiyo? kēśavanai pāḍuvum nī kēṭṭē kiḍattiyō? conveying senseless notes; can't you hear O deluded girl! their bangles and necklaces making a tumultuous sound, do you not hear it? in praise of Nārāyaṇa; The Killer of Keśī, and yet sleep on? O damsel of glittering splendour, open your door! let loose a short while, are grazing all over. rise up! Let us sing that He may give us the drum. To the God of gods let us go and offer obeisance and service. Taking pity on us indeed, Krishna will bestow upon us His grace. Fragrant smoke of incense wafting around; you lie asleep. O Cousin! Arise! Open the bolt on the ornate door! Dumb or deaf, exhausted or tired? Or has she been bound by a spell of stupor? O Lord of Maya! O Mādhava! O Lord of Vaikuṇṭha! But will you open neither the door nor your mouth? He will surely bless us with His drum. in his sleep alive? O Lazy One! Our precious jewel! Shake off your stupor and open the door. expert milkmen of many young milch cows. Faultless, skilled warriors who rout their foes in open battle. O Charming peacock-like damsel! With hips like a snake's hood. And are chanting the praises of the Lord the colour of the rain-cloud. Wherefore now this sleep? Rich maiden, immobile. yearning for their calves bellow and drip milk. The floor turned into a mire from the flow. who in wrath slew the king of Lanka, yet you're silent! Kindly arise now! The neighbours are scandalised. They went, singing the praise of the One who Killed Bakāsura. The One who decapitated the Demon King Ravana. Venus has arisen and Jupiter has already set. Look! the birds are chirping away, O lotus and doe-eyed one! kindly leave off your aloofness, don't lie there, join us! The red lotuses have bloomed and the blue lilies closed. Have gone to their temple to blow their conches. You boasted that you would awaken before us. Shameless braggart, get up, girl, you adroit talker! The Conch and Discus in His mighty hands! Hello! tender young Parrot, yet sound asleep? Don't be so sharp and shrill in calling me Great Ladies, I am coming. We have known for long your promises and power of words. Clever you all are in verbal altercation, but let it be me! Come along quickly now, what restrains you? Has everyone come already? Yes, come out and be counted too. and Who would destroy the arrogance of His foes. Promised us, the cow-maids that He would give us the drum. We have come pure in body and mind, to awaken Him with song. Open the giant twin gates and grant us access. for generosity with cloth, water and food to the needy. the beacon light of our community of cow-herders. and pierced the sky, sleep no more! Arise! You together with your younger brother, sleep no more! Arise! O Daughter-in-law of Nanda Gopa the owner of many mighty elephants. and who possesses strong shoulders never turned back on the foe. Nappinai! Lady with charming fragrant tresses! Open the door! Listen to the roosters crowing everywhere. Flocks of cuckoos coo incessantly from the bowers of madhavi flowers. You, so expert with the ball, we will chant the names of your Lord. Come, joyfully open the door! Your broad chest resting on the bosom of Nappinnai. Her tresses adorned with flowers, at least open your mouth! Will you never allow him to rise? Are you unable to bear separation from him for one second? This is unfair and does not behove you. out of grace, to remove the fear of their enemies; Arise O Lord! of your enemies, O Lord Immaculate and Holy, Arise! enchanting rosy lips and slender waist, please arise! at this very moment, for helping us to fulfil our vow. tōttamāy ninna śuḍarē! tuyil ezhāy! O son of the one who is blessed with countless, generous cows. Showering milk, overflowing jars kept under their udders. The effulgent light of the universe, please arise. To fall helpless at Your feet. resembling little bells, open upon us little by little? We will be freed from the curse of all our sins. roaring loudly, it steps out majestically. enquire into the purpose which has brought us here. cenṛaṅgut tennilaṅgai ceṛṛāy tiṛal pōṭri! ponna śakaṭam udaittāy pugazh pōṭri! kunnu kuḍaiyāy eḍuttāy! guṇam pōtri! vennu pagai keḍukkum nin kaiyil vēl pōṭri! You measured the earth that day; blessed be Your feet! You went and destroyed Lanka in the south; blessed be Your prowess! With a kick You destroyed the cart-demon; blessed be Your glory! You flung the calf-demon as if from a sling, blessed be Your anklets! You lifted up the mountain like an umbrella; blessed be your goodness! O Vanquisher of foes; blessed be the spear in Your hand! Won't you relent, and have compassion on us? lodged with another to be bred unknown. You frustrated the chagrined tyrant's plots. A raging fire within his (Kamsa's) belly. We have come here your beggars O Nedumal (Trivikrama)! and Your might, our sorrows dispelled, we shall rejoice. capable of setting the world atremble with their tumultuous sound. O Lord who reclines on the banyan leaf. Thus shall we be in bliss, cool and united with You. is our good fortune that You have been born amongst us. with You can never be undone by anyone. we called You by trivial names, don't be angry O Lord! Nor withhold Your gracious drum! ittai paṛai kolvān annu kāṇ govindā! and praise Your golden, lotus-like feet. should not decline our service and homage. Change all our other desires O Lord! Lakshmi's Lord, Who has churned the Ocean full of ships. and secured the drum which they desired. fresh and cool, In a garland of thirty verses in classical Tamil. With red eyes and comely face, and be happy evermore.